Lockers can be found throughout the station building. They come in a range of sizes at fees of 300, 500 and 700 yen. There is usually a change machine nearby, or sign pointing the way to one. 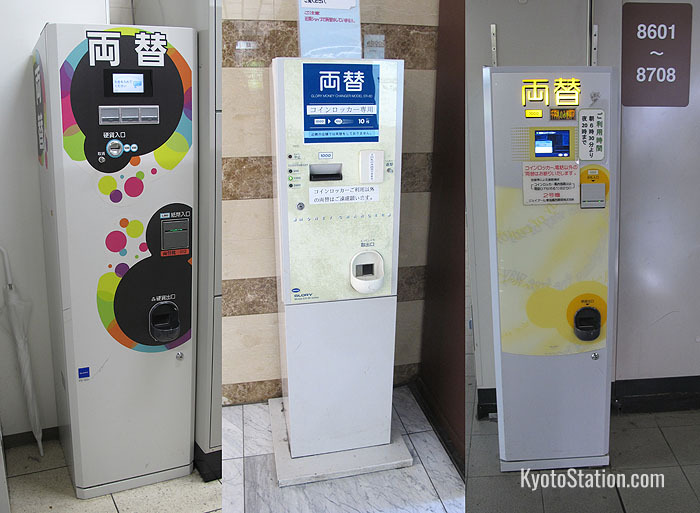 These are easy to use and can change 1000 yen notes for appropriate coins. If your luggage is too bulky for a locker you can use the Baggage Room on the B1 floor. See below for more details about Left Luggage and where to find it. Lockers are located at several locations on the north side of the station. 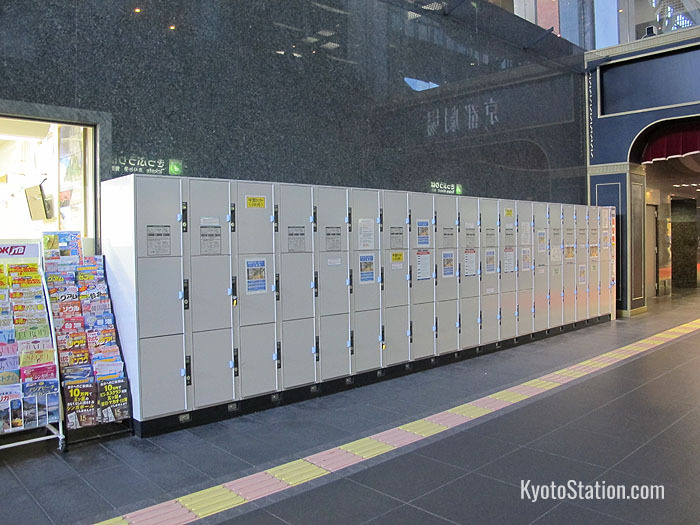 The most convenient locations for lockers are those nearest the ticket gates. 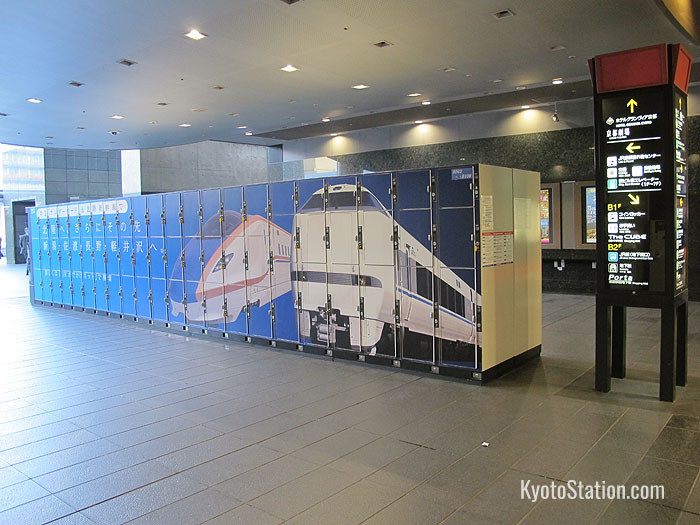 If you are exiting from the Central Ticket Gates then you can find a bank of lockers on your right opposite the Central Ticket Office. If these are full, walk past the ticket office towards the Kyoto Theater and look to your immediate left. There are two banks of lockers facing each other there. 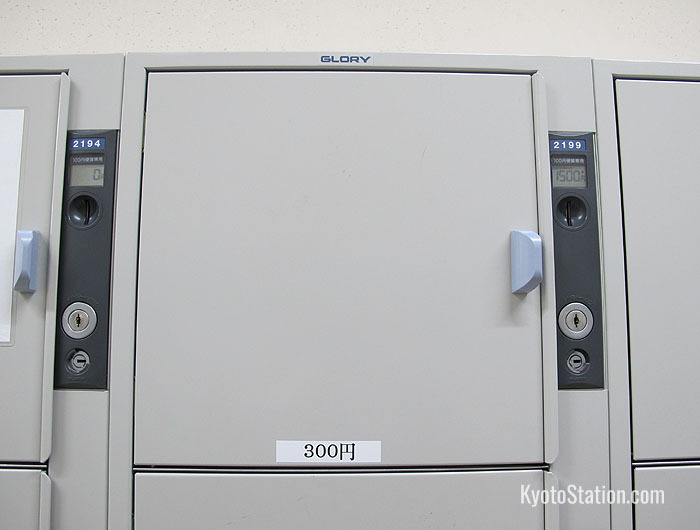 There is also a room full of lockers outside Kyoto Theater. To find it, exit the Station building and you will find it on the right just past the escalators for the Theater. 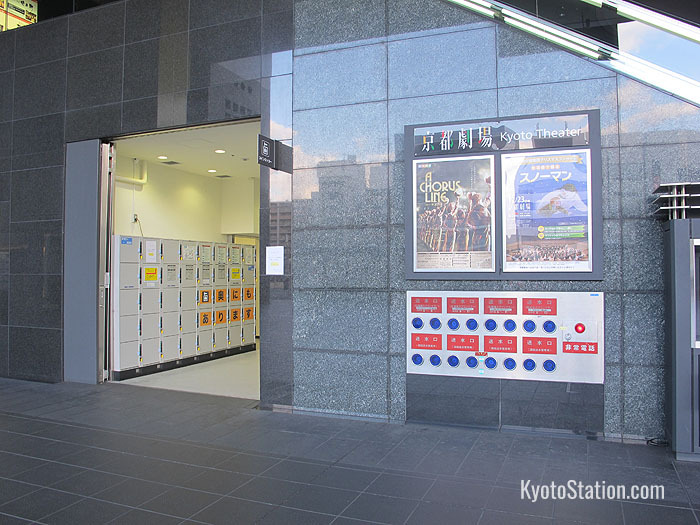 You can find more lockers to the west of the Station Building’s Central Exit, opposite the Cube and just outside the main entrance to Porta Underground Shopping Mall. There is a room full of lockers on the 2nd floor pedestrian walkway that runs between the north and south sides of the station. This locker room is just a little to the north of the West Ticket Gate. 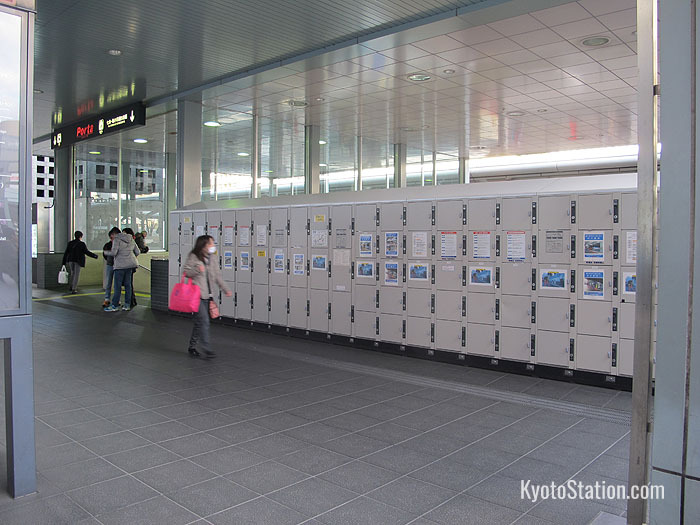 If you are exiting from any of the Shinkansen gates or from the Kintetsu Kyoto Station then the nearest lockers are on the south side of the station. 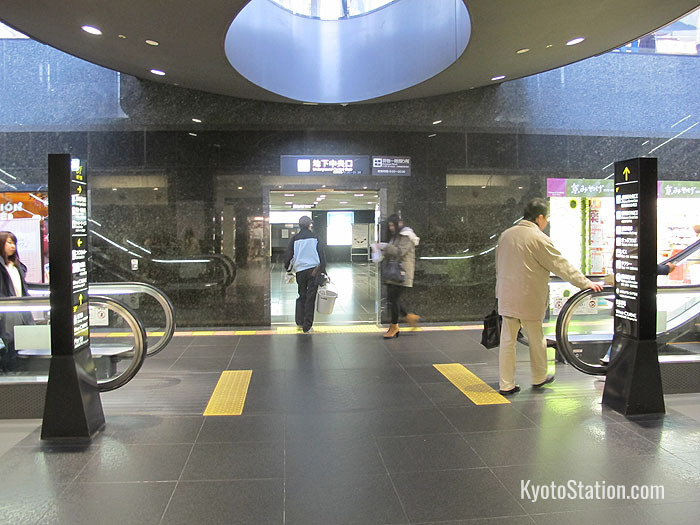 Simply exit the station via any of the southern exits via the indoor Miyako Michi or the Asty Road shopping streets. 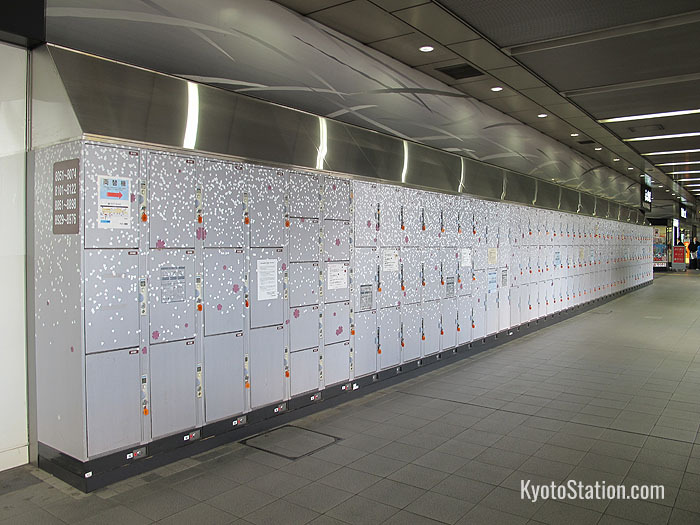 There are banks of lockers running the whole length of the southern side of the station facing out onto Hachijo Street. Lockers come in three sizes and are priced accordingly. These charges are for one use and for one day. 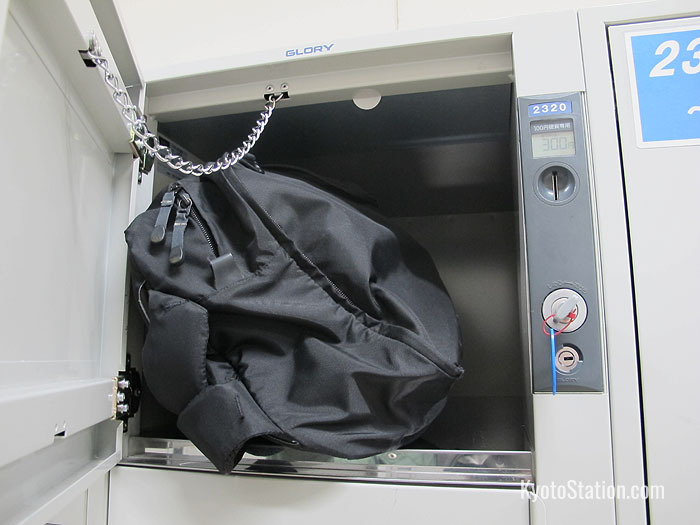 A new day starts at 2:00 am (at midnight for lockers on the south side of the station), so if you haven’t retrieved your property before this time, you will need to pay an additional fee. The lockers are very easy to use. Then remember to take the key with you! Each locker has its own number which is also on the key so you can find it again. When you want to retrieve your property, put the key in fully and turn it clockwise to open the locker. 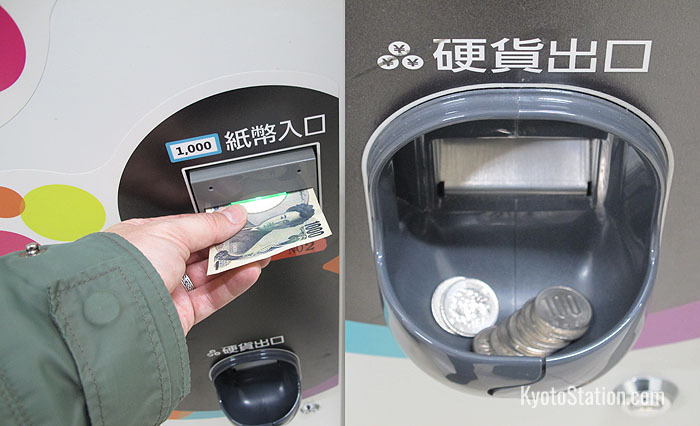 If you need to pay an additional fee the amount will be shown in the display over the coin slot. You cannot use a locker for more than three days. After three days your property will be transferred to another storage area. If your property is not claimed from storage within 30 days it will be disposed of. 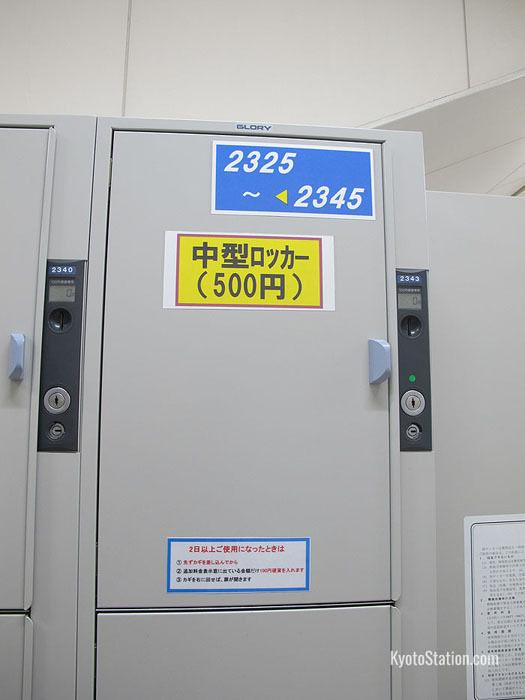 If you lose your locker key, you will have to pay 2500 yen to replace it. Certain items must not be stored in a locker. These include, valuables, explosives, weapons, animals and items that smell strongly. If you are using a locker room, check what time it opens and closes. Some locker rooms are closed after 23:00 or 24:00. If you don’t have the right change for the lockers, there is usually a change machine nearby or a sign showing where the nearest one is. These come in various shapes and sizes but are always super simple to use. 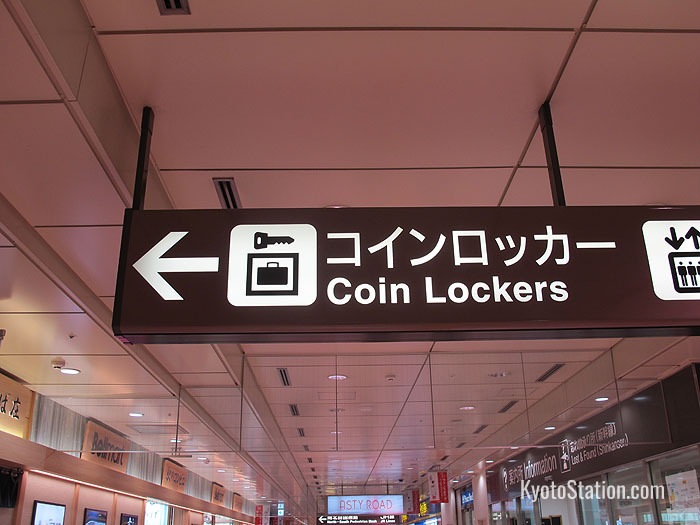 If you are using the Kyoto Subway Station, lockers in Porta’s underground shopping mall may be more convenient to use. These are priced at 300, 500 and 600 yen. The lockers are used in the same way and similar rules apply to their usage, but additional fees will accrue at midnight. 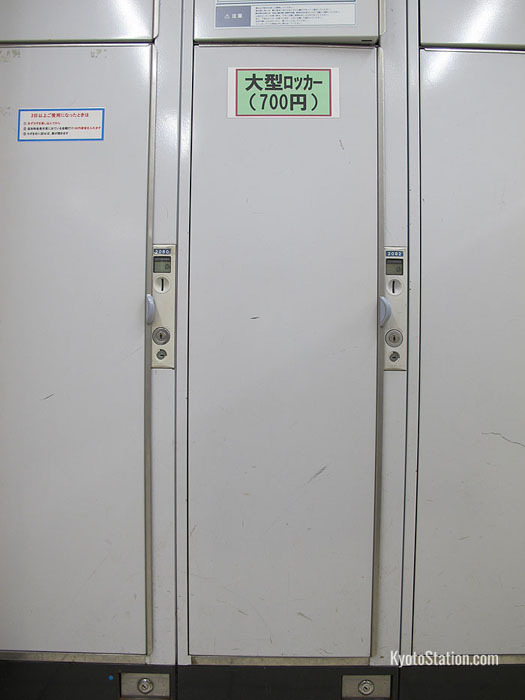 Lockers are situated by the following exits: A3, A2, B7, B12, C3, C9 and C10. If you need change for the lockers, please use the change machine by the B7 exit. Customers are asked not to ask nearby stores for change. 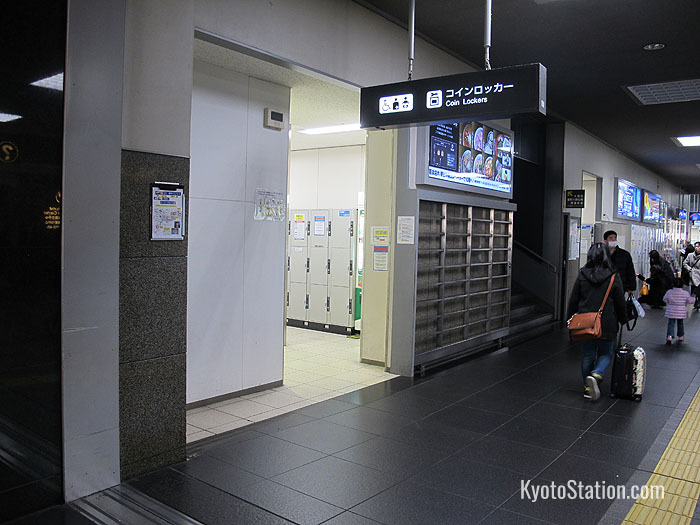 Luggage that is too large or bulky for a locker can be left at the Baggage Room on the B1 floor of the Kyoto Station building. To find it, use the escalators in front of the Central Ticket Gates. Take the escalators down to the B1 floor. Behind and between the up and down escalators there is an opening with a sign for the Baggage Room above it. 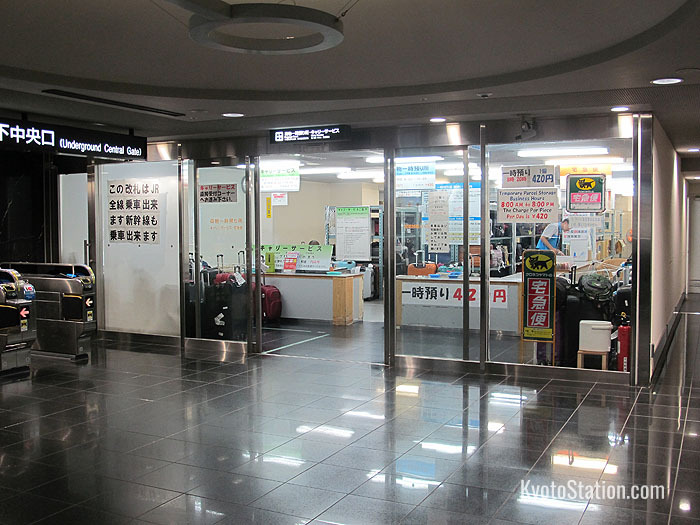 The Baggage Room is open from 8:00 – 20:00 and the fee is 700 yen for each item for one day’s storage. This service is not available for valuable or dangerous items. 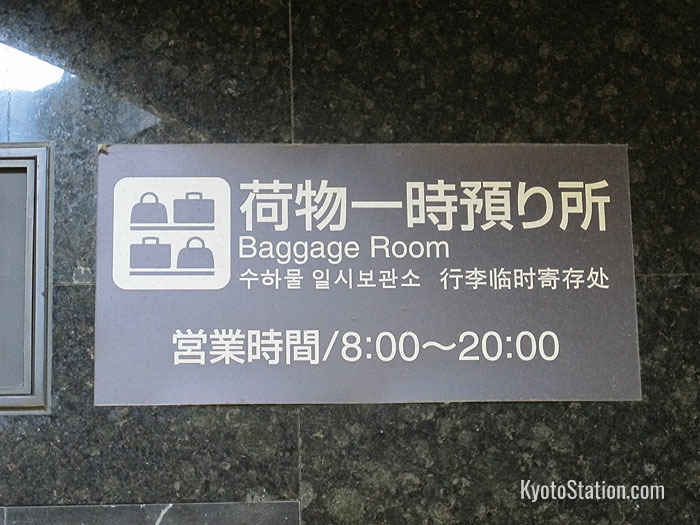 You can leave your luggage at the Kyoto Station baggage room for up to 15 days. 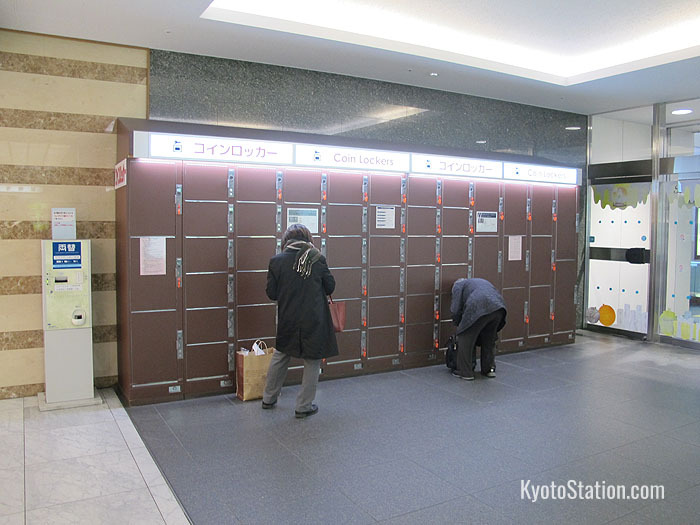 At the Baggage Room you can also pay to have items sent directly to your hotel in Kyoto or to other locations in Japan. 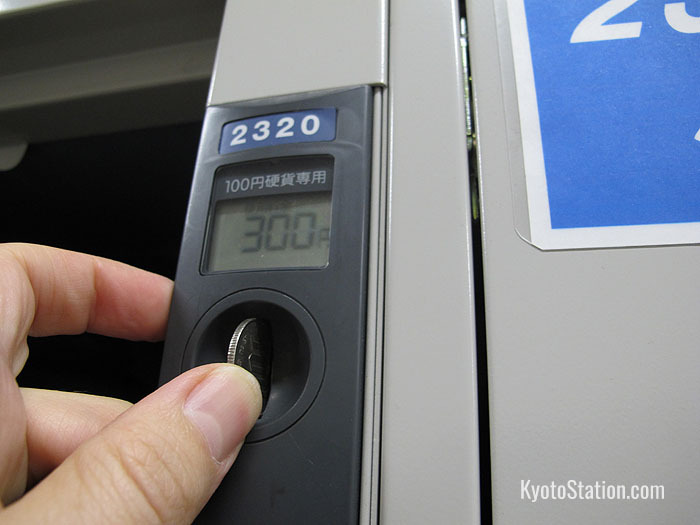 The cost of sending baggage from Kyoto Station to a hotel in Kyoto is 1,000 yen per item.